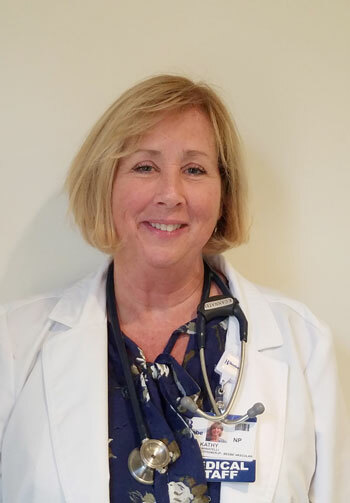 Beebe Healthcare is proud to recognize Kathy Cannatelli, Nurse Practitioner with Beebe Vascular, as the September Living Our Values Every Day (L.O.V.E.) Letter Award recipient. In 2015, a task force of Beebe Healthcare team members met over multiple months to examine exceptional patient experiences and create a system of values, which every team member pledges to follow. Rachel Corbin, a medical assistant with Beebe Vascular, nominated Kathy for the award. Kathy was recognized for building trusting relationships with compassion and kindness and for acting with a passion and love for others to make a difference. Jeffrey Fried, FACHE, President & CEO, Rick Shaffner, Executive Vice President & COO, and Jeffrey Hawtof, MD, Vice President of Medical Operations and Informatics, made the presentation and congratulated Kathy. 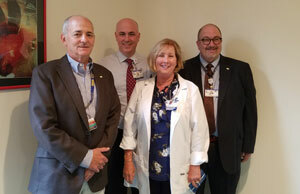 Caption: Shown (left to right) are Jeffrey Fried, President & CEO, Beebe Healthcare; Jeffrey Hawtof, MD, Vice President of Medical Operations and Informatics; Kathy Cannatelli, NP; and Rick Schaffner, Executive Vice President & COO. Caption: Kathy Cannatelli, NP, is the September Living Our Values Everyday (L.O.V.E.) Letter award recipient.